On the weekend of 13th/14th February 2010, the Chairman of the Council of the Australian Air League, the League’s Public Officer, the National Staff and the Executive Commissioners had the pleasure, and honour, to spend a Saturday and Sunday with the ‘cream’ of the Australian Air League’s youth membership. The selection of the Cadet of the Year took place in Queensland in conjunction with the meeting of the Council of the Australian Air League, which was conducted at the Queensland Group headquarters located at Caboolture airfield. Very early on Saturday 13th, interstate members of the Council of the League, together with the candidates from Victoria and New South Wales travelled to Queensland, were met on arrival and transported from the Brisbane airport to Caboolture to meet up with the Queensland based members of the Council and the two candidates from The Queensland Group. Our Cadet of the Year candidates together with Gp. Comr. 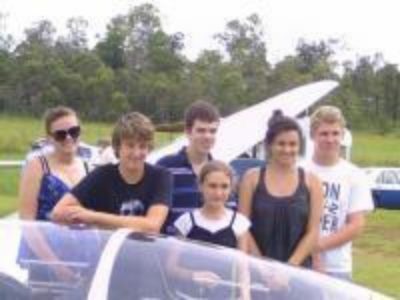 Michael Hodge travelled on to Gympie to enjoy a day of gliding. Later in the day they travelled back to their accommodation at the M1 Motor Inn where they enjoyed the pool and networking prior to dinner where the Chair of the Council of the Australian Air League Inc., the League’s Public Officer as well as the National Commissioners and the Executive Commissioners joined them. After dinner all moved to a private room at the Motor Inn where all candidates made brief presentations to enhance their opportunity to be selected as the League’s Cadet of the Year. All senior Officers including the Executive Commissioners marked these presentations taking into account delivery, confidence and relevance. The next day, Sunday after breakfast, all assembled at Caboolture Airfield and whilst the four Executive Commissioners met to discuss cooperation between their Groups at the Aero Club, the panel including the Chair of the Council, the Public Officer and the National Commissioners aided by Gp. Comr Hodge, conducted the selection process for the 2009/10 Cadet of Year. Any of the nominated entries would be able to represent our Organisation with pride. • To be selected for this award you must be able to demonstrate a commitment to participate, and assist, in various functions at a Group and at a National level during 2010. This is the ambassadorial role we see our Cadets of the Year fulfilling. They are our representatives and the League requires their ongoing involvement once the winners have been announced. To demonstrate this, you will be required to prepare a 10/15 minute presentation to be delivered after dinner of the Saturday night to the League’s senior Officers. We will have a laptop and data projector available for your use if required. This is your opportunity to demonstrate your ability and willingness to act in an ambassadorial capacity; giving evidence of your prior involvement with, your enthusiasm for, and your ongoing plans to leverage from, the AAL. We ask that you tell us what you perceive the Cadet of the Year to mean and what do you see as the role and responsibility of the successful candidates. • Your knowledge of the AAL and its operation covering Field, Administration, Education and Air Activities. • Your Dress and Bearing, both in uniform and casual attire. • Your personality and ability to mix with others. • Your ability to express yourself and communicate with all ages. • Your behaviour, attitude and manners when attending the Restaurant as a group as well as your behaviour and attitude when left overnight in the Motel under the indirect supervision of Senior Officers. After lunch, at the Queensland Group Headquarters, the results were announced in front of the League’s senior Officers and the Cadet of the Year badges were presented to the winning candidates. On behalf of the Australian Air League Inc., may I extend hearty congratulations to the winners and commiserations to their colleagues who were unsuccessful. To miss out on selection in such company is no disgrace as those selected were truly outstanding in all aspects and their Parents and Officers can be very proud of them. The League’s thanks go to the Queensland Group staff that assisted with the operation over the weekend with catering and transport. It has been decided by the Council of the Australian Air League inc. that the 2010/2011 Cadet of the Year selection will be conducted in Sydney, in conjunction with the meeting of the Council of the League, over the weekend of 19th and 20th February 2011. The selection criteria to be used will be the same as used for this year’s competition. Photos of the weekend can be viewed here.